Using a bread machine to mix up my dough, knead it and let it riseis my favorite. I set it on the dough cycle and when it’s done, I just place loaves in bread pans, cover them and let them rise one more time in a warm place. I hate the shape of the bread that my machine makes and I also hate that 2 pieces on the end have a huge whole in the middle from the paddle. Once the dough has risen again, brush them with a bit of melted butter and bake in the oven. They come out the way bread is supposed to look! Do you have bread maker? Here is a link for the one I have. It has lasted me over 20 years and I use it often! Even in the summer I make pizza dough and cook the pizza on the grill so I don’t have to heat up the house! It is a bit bulky but saves so much effort, it is worth losing the space on the counter! I hope you enjoyed the post today for this Brioche Recipe! Here is another perfect bread machine recipe for English Muffins! And here is one for Rye Bread! My bread machine is one of my favorite kitchen tools! 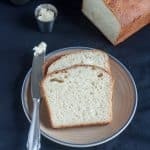 It makes it so easy to make delicious bread at home! Warm milk to between 105-115°F. Place ingredients in the bread maker in the order given. Turn bread maker on dough only mode. Use no stick spray or butter to grease 2 bread pans. When dough has risen in bread machine, remove it onto a floured cutting board. Knead dough to remove all of the air. Cut the dough in half. Form each into loaf shapes. Place in prepared pans, seam side down. Turn oven on low and set breads near the vent to rise again. Usually about 30 minutes. Until dough almost reaches the top of the bread pans. If you want a crispy crust, brush the top of the loaves with cold water. For a softer crust, brush the top with melted butter or a bit of oil. Increase oven temperature to 400°F. Bake for about 30 minutes, until golden. Internal temperature should be 200°F. You can also rap the top of the bread with your knuckle, if it sounds hollow, it is done. I love brioche but never made it myself, this looks like such a great recipe! It’s so easy, Emily! Give it a try! Thanks so much for your comment! Wish I have a warm slice with butter right now. 🙂 Yum! Looking at it makes me want to start a batch right now! Thanks, Valentina! This bread looks so yummy! It would go perfect with the soup I’m making for my boys tonight. I love it with soup! I made split pea yesterday. I should make some to go with the leftovers! There is nothing like waking up to the smell of fresh white bread. I love brioche with soft butter and jam.. especially when it’s hot and the butter melts.. oh yum..! You’re making me drool! 🙂 Thanks so much, Veena! Brioche is such a lovely light bread, perfect served warm with a little butter and homemade jam. Baking bread is a funny thing, to get the timing just right. So easy to go that little overtime; am glad you caught it before you ended up with a loaf of charcoal. Oh Lordy, me too! I would have cried!! Thanks for your comment, Helen! I love brioche! Especially homemade! When I moved from CA back to the east coast, I sold my bread maker since we were driving all our stuff across country. I miss it and need to get another! This is a great recipe Beth and I really look forward to making it. I’ll have to do all the kneading myself though 🙂 . And thanks also for the shout out to my podcast! Absolutely no problem! I love the podcast! It is a wealth of information! Thanks, Elaine! I never would have thought you could make brioche in a bread machine. Do people still use bread machines? It seems like I haven’t seen them for a while. I never owned one, but I LOVE making bread every now and again! The bread machine makes it so easy, you can make bread any time! Thanks for your comment, Catherine! Without a doubt, one of the best smells in the world! I don’t mind kneading but the machine make it easier to set it and forget it for an hour and a half! Thanks, Ramona! That is totally easy to do! Especially before they cool! Thanks, Brian! My podcast was so interesting that I “almost” caused you to burn your brioche??? I can’t think of a better compliment. LOL. Thanks so much for listening to the podcast and I hope it was helpful. This bread looks amazing. Keep up the great work! It was very interesting and super informative! You are a great help to all of us food bloggers!! Thanks for all you do, Casey! !